Jakob’s kinetic facade product Windwave is a great example of how stainless steel wire and art can combine to form stunning visual works. Windwave is made up of hinged metal shapes that move with the wind and reflect the surrounding light, fully supported by wire rope structures. The changing natural conditions of light and wind create a surface that continuously moves and changes in appearance. 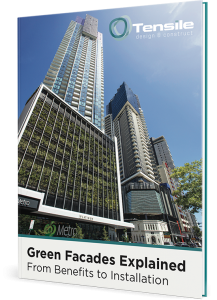 This makes Windwave ideal for creating ‘moving’ facades that are never dull or static but are always changing and fascinating to watch. It’s becoming very popular, and has been used to great effect all over the world. Windwave was used for the pavilion facade at the Future Energy Expo 2017 in Astana Kazakhstan. This seems an appropriate choice for the event, given that Windwave requires nothing more than natural sunlight and wind – renewable energy sources – to create its stunning effects. 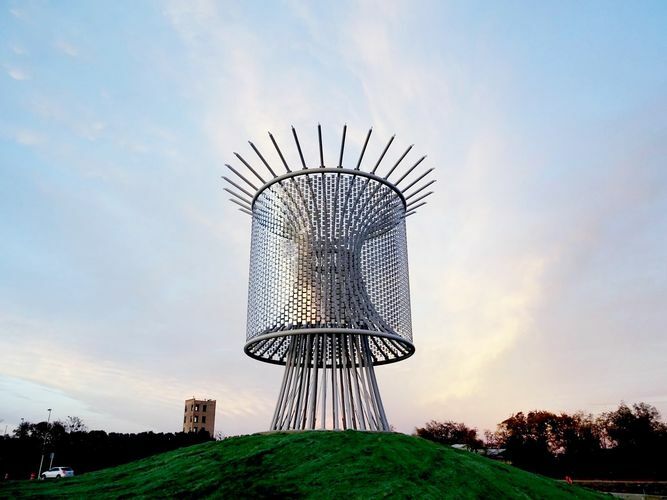 Environmental artist and sculptor Ned Kahn used Windwave to create his art installation Wind Roundabout in Fort Worth. The 30ft free-standing cylindrical sculpture features thousands of small aluminium square mirror-like panels that reflect light and move with the wind, creating ever-changing patterns. During the day, the panels reflect sunlight and flap gently as the wind moves across their surface and through the sculpture. As the light shifts and moves during the day, the patterns shift and change in appearance and colour. At night time, lights from passing traffic are reflected, creating a soft glow. This means there is no predictability about the sculpture, as it depicts flashing and twinkling lights at times and produces wave and flame-like patterns at others. The effect of the moving sculpture pieces has been likened to the way natural forces create wave patterns on water or tall field grasses as they sway in the wind. Windwave is a versatile product that can be used in a variety of ways for art installations or to create stunning building facades. If you have a project in mind that requires stainless steel wire with an arty edge, get in touch with our team. Jakob is a market leader in this space, with products that have been created to be fit for purpose, rather than adapted from other industries.